The company was started by Hamish Robertson, who contracted Castle Precision Engineering Ltd. – Ivor Tiefenbrun’s father Jack’s company – to make the deck for him back in 1970. The RD11 was developed by Hamish along with Ivor and Jack, and distributed by C. J. Walker and Company. But in February 1973, Linn Products Ltd. started selling turntables made by Castle Precision Engineering, which were apparently very similar to Aristons. Meanwhile, Ariston was taken over by Dunlop Westayr Ltd and renamed Ariston Audio Ltd, and Hamish Robertson left. Despite the obvious similarities between the two decks, neither was the height of engineering innovation. Both owed much to the Thorens TD150 in design terms, not to mention the original AR turntable. In truth, until the advent of the Oracle and Michell GyroDec (which appeared within weeks of each other in 1981), all belt drive decks were pretty similarly fashioned with a plinth enclosing a sprung subchassis onto which the motor, bearing and armplate sat. Indeed, the RD11 was described by Ariston as “very simple in design concept”. It sported a “high torque” 24-pole AC synchronous motor, “specially designed by Ariston engineers”, driving a two-piece 3.2kg platter via a square-section rubber belt. This rested on a single-point main bearing with “precision ground mirror-finished shaft” and a “perfectly spherical ball-bearing”. A slip-clutch mechanism on the belt drive prevented stretching, and the motor provided two speeds, with small front mounted trim pots for fine speed adjustment at 33.333 and 45RPM. Ariston claimed a wow and flutter figure of 0.06% and rumble at -78dB, which was excellent by 1971 standards. The steel subchassis was decoupled from the armboard for isolation from external vibrations, and sat on three pliant coil springs to decouple it from the heavy real wood plinth, and a decent acrylic lid completed the package. True enough, this will all be familiar to LP12 owners, even down to the heavy rubber platter mat which early Sondeks also had. The only obvious visual differences were the smaller, circular armboard the Ariston used, the position of the on-off switch which was on the front right of the deck, and the very seventies pin-stripes around the inside of the plinth top. The RD11 sounded excellent in a nineteen seventies sort of way, being clean and open with powerful, extended bass and crisp highs. By modern standards imaging is rather diffuse, the midband coloured and the bass loose, but it still makes a pleasingly large, expansive and euphonic sound. Modern super-decks are often too analytical for their own good, a criticism you couldn’t level at the Ariston which sounds big, fat and warm regardless of the what’s actually on the record! SME’s Series III tonearm was a favourite partner to the RD11, and the two worked nicely together. Other popular suitors were with Grace’s G707, ADC’s low mass LMF arms, Rega’s Acos-derived R200 and SME’s ubiquitous 3009S2. These days the obvious choice is Rega’s RB300 and its later derivatives, although SME’s 309 and IV work well too. 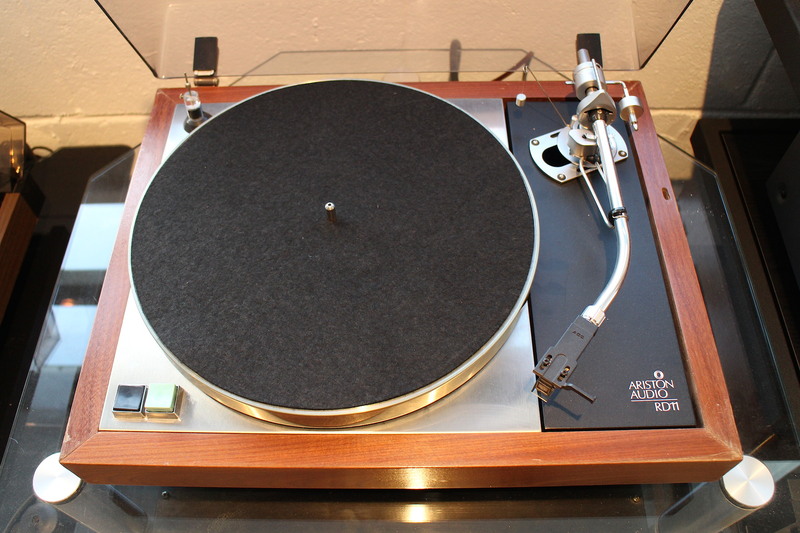 If you’re looking for one secondhand, then pay £200 for a good early RD11 or £350 for a later Superieur version and you’ll have a cracking high end deck for sub-Rega money. Better still, many Linn parts fit the RD11, such as the Valhalla power supply, Nirvana spring kit, etc., although the main bearing and armboard are entirely different things. Sadly the Ariston story does not have a happy end. The company went downmarket in the early eighties, making some pretty good budget tackle like the RD40, RD80 and Icon. But the advent of CD effectively finished Ariston, and despite some last-ditch attempts at diversifying into electronics, it was ‘game over’. Hamish too is sadly no longer with us, but his legacy lives on with some fine turntable bargains on the secondhand market. Hi, I have an RD 11 with the captive spherical ball bearing – only I don’t have the bearing. It was lost during a housing move. Do you know if anyone has replacement bearings available or what it might measure so I could have one made? Thanks in advance.